Well, this just in: Jake Cody is a sicko. Less than 18 months removed from his first major tournament victory, Jake Cody has completed his climb to the top of poker's highest mountain. At the tender age of 22, Cody has joined just two other men in achieving poker's Triple Crown. His EPT victory came in Deauville, France in January of last year, and he followed that up with another major title at WPT London just a few months later, Now today, in just his second WSOP event, he's added that elusive (or not so elusive, in Cody's case) bracelet to his trophy case. It's hard to overstate how impressive of an accomplishment it is. Perhaps it's his soft-spoken tone or his haphazardly spiked hair. Something about Jake Cody indicates he's not much of a threat. But that's not exactly the case. Spurred on by an astoundingly loud cheering section of his countrymen, Cody blasted through his matches today. He used up only one of his three bullets to take all 4.8 million of Yevgeniy Timoshenko's chips, locking up the gold bracelet and sending his throng of supporters into a frenzy. It really was an impressive lesson in heads-up poker from a man who has a strange propensity for being underestimated. Cody's path to this final was no cakewalk either. He knocked off Brandon Adams in the first round, then bested 2010 Player of the Year Frank Kassela to punch his ticket to to Day 2. Dani Stern was no match for him in their Round 3 contest, and Cody advanced through Jonathan Jaffe in the fourth round to move into the money. He had just one match to play on Day 3, but he admitted in his interviews that Anthony Guetti was his toughest challenge to that point. Cody was dangerously short-stacked for a good while during that match, but he stood his ground and battled back valiantly to take all the chips and earn his spot among today's final four. Cody's semifinal match was one for the ages. If anyone has so thoroughly beaten Gus Hansen, we can't remember when it happened. Just like the final, Cody needed just one bullet to dispense with Hansen in a lopsided battle that went the opposite way many would have guessed. In the final, Yevgeniy Timoshenko put up a good battle, but Cody was just too much. In what had to be his toughest two tests, he didn't need any of his add-on buttons. Not even one. 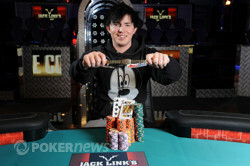 So then, the second gold bracelet of the 2010 World Series of Poker goes to the young Brit, Jake Cody. With it comes the Triple Crown, a good bit of exposure on national television, and more than $850,000 in U.S. dollars. Out of those, we're guessing the Triple Crown means most to the young Brit, and we at PokerNews send our congrats out to Cody and his countrymen for a truly impressive showing here this week! Two events in, it's already shaping up to be the Year of the Brits in Las Vegas. We've still got another 54 bracelets left to hand out, so join us right back here tomorrow for plenty more action. Until then, all that's left is ta-ta, cheerio, and goodnight! On the button, Timoshenko limped in and faced an all-in move by Cody, who was clearly trying to bully his opponent into submission. The Ukrainian would not back down, however, and made the call with his . 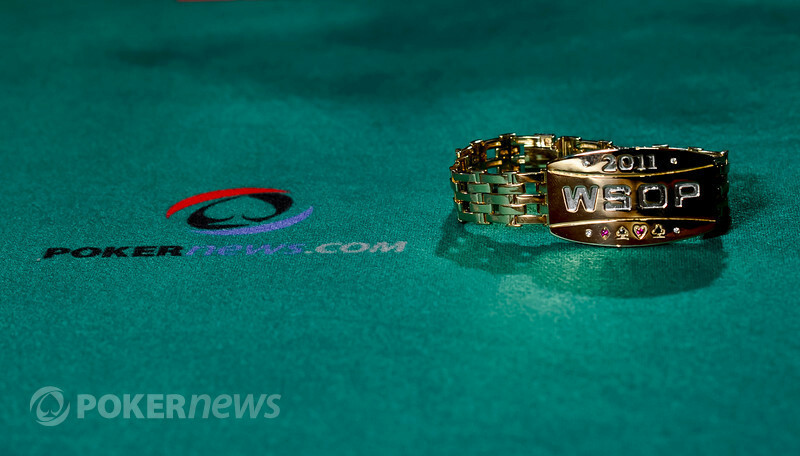 Cody showed down the and found himself needing help to close out the match and claim his first WSOP bracelet. The British tournament phenom vaulted into the lead with his top pair and Timoshenko now needed to catch and ace to survive. Fourth street was a dead-end for Timoshenko and he was down to possibly his last card in his incredible run through one of the most difficult fields ever assembled. The crowd let anyone who missed the action know exactly who had claimed victory, bursting into a rousing chant of "Triple Crown! Triple Crown!" as their countryman has now completed the most difficult feat in all of poker, winning an EPT, WPT and WSOP event. Yevgeniy Timoshenko was extremely gracious in defeat and shook Cody's hand in congratulations. The Brit's emotions were written on his face as he exhaled deeply and broke into wide grin, obviously enjoying the unique atmosphere surrounding his crowing achievment. Yevgeniy Timoshenko opened to 320,000, and Jake Cody put him all in for 2.308 million. Timoshenko called, and he was at risk for his tournament life. "It's like kissing your sister" someone in the commentary box said. He was unaware of the drama that would follow. The flop came out , and the Brits in the crowd let out a collective, "Oooooh!" as their man had picked up the ol' backdoor flush draw. You can just imagine the noise on the turn, then, Cody just one club away from the bracelet. The spectators leaned in toward the stage, elbow-to-elbow, and they let out another rising, "Ooooooooh" in anticipation of the river card. "Awwwwww," everyone on this side of the arena yelled. It was a split pot, and Cody doesn't have that bracelet just yet. 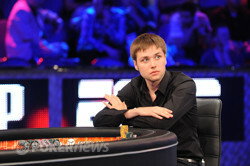 Timoshenko let out a wry smile as he pulled his chips back into his stack. Yevgeniy Timoshenko opened to 240,000, and Jake Cody three-bet shoved. Timoshenko gave it a look for effect, but it was pretty clear he wasn't calling. He mucked, and he's down to about 2.2 million now with less than 20 big blinds. Holding the button, Cody raised to 245,000 and Timoshenko returned the favor by shoving all-in. Cody called and turned over the , which was slightly ahead of Timoshenko's percentage wise. 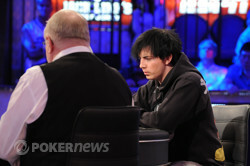 The Brit's hand held through the flop and Timoshenko needed help on the turn or river. A blank on fourth street for Timoshenko and he is down to his last card, needing a jack or a ten to win the hand. The dealer offers no assistance and what we thought was a loud rooting section has absolutely exploded in drunken joy as their countryman takes a commanding chip advantage. 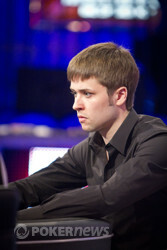 Timoshenko appeared crestfallen as he cashed in his last remaining 1.6 million chip add-on. Cody still has two bullets left in his chamber and with the blinds climbing rapidly, the Ukrainian needs to make some moves in order to survive. While the crowd continued to scream and shout in support, Jake Cody open-shoved from the button and Timoshenko paused for a few seconds before releasing his hand. The all-in move may become a standard play as the blinds continue to climb.